This year the regatta again proved its broad and enduring appeal, with the biggest entry numbers in nearly a decade – 104 boats across 13 divisions. There was a noticeable change in the makeup of the participants too. One of the most obvious changes was an increase in female participation, both on the water and on shore. Manuela is the first female Chairperson the regatta has had in its 16 year history, and is pleased that the regatta is becoming more representative, in terms of its participants and its organising committee. One of the female sailors taking part was Sharon Ferris-Choat, the Kerikeri sailor whose multiple achievements in sailing include Olympic Games, Volvo Ocean Races and World Records. Sharon was one of three female crew on TP52 Kia Kaha. She too believes that women are playing a bigger part in yacht racing, and would love to see more women at the professional level in sailing. “There’s been a huge influx of women participating and doing some of the key roles.” Sharon told us. There were also more youth sailors at this year’s CRC Bay of Islands Sailing Week. Youth sailing coach Robbs Hielkema, who joined the regatta organising committee this year, was keen to see more opportunities for young sailors to get involved in New Zealand’s biggest multi-day keelboat event. One of Robbs’ students, 12 year old Oscar , sailed on Tony and Nina Kiff’s boat Wetherley. He was allowed to take the helm for the entire race on day two of the regatta, and placed a respectable 9th out of 16 boats. Not bad for a first-time keelboat helmsman. 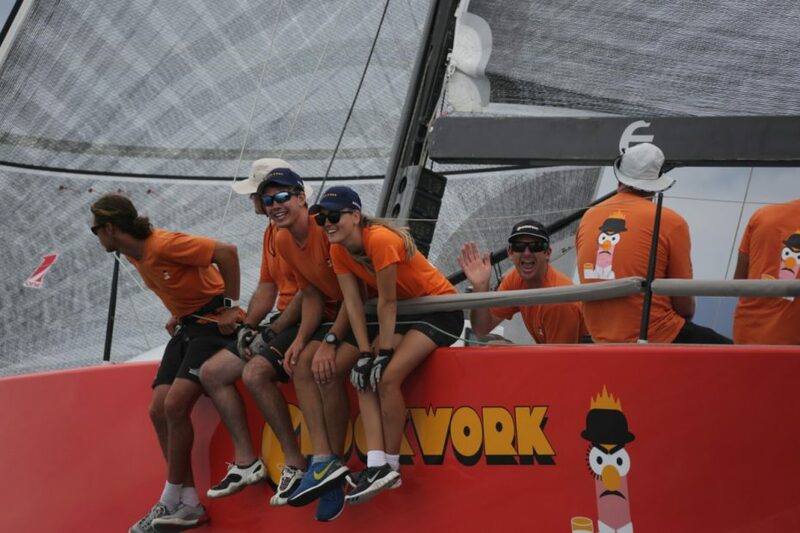 In the Weta fleet, Ted Houry, aged 11, was so concerned about crew weight on day three – the lightest day of the regatta – that he jettisoned his dad from the boat, and went on to sail to victory on his own. Paralympian Chris Sharp, who placed second overall in the Weta racing against able-bodied opponents, was pleased to see younger sailors getting in and giving it a go. “Ted was in the two-handed division but thought he’d have a crack at the single, and went out there and nailed us! He showed that if it’s light, he’s dynamite,” said Chris. Full results from the three days of racing, plus overall series winners, are available here. Photography from all three days of racing and video round-ups covering each day’s events can be found on the regatta website and Facebook page. CRC Bay of Islands Sailing Week – described by Peter Montgomery as “New Zealand’s best big-boat regatta”, takes place each year at the end of January, on the week preceding the Auckland Anniversary long weekend.